Disclaimer: these are obviously my own personal views not any organisational view. Below are some preliminary thoughts on the debate that has been ongoing on the recent pilot scheme using posters attached to vans telling illegal migrants in the UK to "go home or face arrest". A description of it is available on the UK government website. "Over the next week, two vans will be driven around Hounslow, Barking & Dagenham, Ealing, Barnet, Brent and Redbridge and will show residents how many illegal migrants have recently been arrested in their area. They will also show a text number that migrants can message to arrange their return." A picture of one of the vans is below. Not surprisingly this has generated a lot of debate with many expressing satisfaction that a direct message is being put forward and opponents expressing outrage including using the phrase "racists vans" to describe the policy. To get a reasonable feel for views largely in favour of the policy, the Daily Mail website commentors are strongly leaning towards the policy (though many feeling it could distract from tougher policies and others worried the targets of the policy wont understand the signs) whereas readers of the Guardian are, for the most part, vehemently opposed to it. There are a lot of questions that this policy raises for people interested in behavioural science and its applications to policy. I want to step back from the moral and economic question as to whether there should be more or less migration to the UK and try to focus on the policy itself as a method for enforcing migration laws. Firstly, it is worth thinking about whether there is a sensible policy idea underlying this. If we take the basic logic of a lot of policies like this, then substituting expensive, punitive legal actions with less costly and less punitive changes on face value has some appeal. I imagine a lot of people working in this space would hate to see the above image described as a "nudge" but there is no doubt that the people designing this policy were partly drawing from this type of thinking. They are presenting a moral norm, clear threat and offering a simple way of efficiently complying with the law by texting a number. Supporters of this scheme could argue that this is exactly what the recent literature has been suggesting, namely using non-pecuniary inducements more smartly and making compliance simpler. If we do take this at face value as a genuine attempt to use smarter techniques to achieve a policy objective that otherwise would be solely pursued through coercive means, then, as well as questions about the actual physical and graphical design of the campaign, the basic questions one would ask of such policies include things like: What was the process that led to the policy? Was it based on existing literature? What are the main scientific or policy principles underlying the design? How will the effect be tested? While the number of people calling the number and then subsequently returning to their origin countries is one measure, this will likely be an overestimate as this may be precisely the people who wanted to return and would have done so anyway. How will this be taken into account? What criteria will be employed in deciding whether to roll out the policy further? When will the evaluation be published? What form will the cost-effectiveness analysis take? All of these questions should be asked of any new policy and perhaps even more so for a policy that does not seem to have a precedent in other areas. A number of the newspapers mention that an evaluation of this policy will be considered and its important that we get to read this to have a genuine public debate on the policy. A large consideration is the effect this policy will have on things it is not ostensibly designed to effect. In particular, to what extent will it impact on general anti-migration and racist attitudes? It is very plausible that the very stark "Go home" message could prime such attitudes, particularly among those with general negative attitudes. It is also plausible that regular priming of this message in the general population might lead to people overestimating the extent of illegal immigration and overestimating its negative consequences, creating a climate of what Cass Sunstein calls "misfearing". It might also contribute to a general feeling of unease and threat among legal migrants. Related to both points is whether a proportion of the message being interpreted by people is a general anti-migration message rather than an attempt to improve enforcement of migration laws. The extent of this should be studied. Also, there is a big question as to whether the effect it has on those here illegally is the one intended. Simply stressing people out or exposing them to harsher attitudes is a pointless exercise in itself particularly if the policy is ineffective. Anyone making policy like this should be careful to think about unintended consequences and there is a particular ethical injunction to do this when you are effectively experimenting with things that could impact negatively on minority groups. Furthermore, there is a big question as to how policies like this are captured by political agendas. While the negative commentary in the Guardian and some of the other negative publicity generated by this might seem undesirable to the Tory party who have backed this, this has been in many ways a publicity coup for them demonstrating to voters potentially thinking of switching to UKIP their anti illegal-migration credentials. If factors like this do constrain policy implementation then we will be heavily biased towards policies that create awareness of political agendas rather than real attempts to create efficient less punitive solutions to policy problems. Personally, I can't escape the feeling that this is a distasteful policy that potentially adds a lot of negative sentiment to whatever potential gains it might make in employing softer means of enforcing the law. It also makes me a bit nervous as to where the current government's often genuine engagement with new ways of achieving policy objectives might lead them. What I am sure of is that we need to focus on such policies as much as the ones that are less controversial. There are infinite policy possibilities to enforce laws and regulations using methods that some would agree with and some would find completely unethical and distasteful (see reading list here for a good snapshot of these debates). It would be good to have a better sense of what principles should underly the legitimacy of such strategies. There is currently a lot of debate about wider aspects of the current "crackdown". In particular, the use of spot-checks is under a lot of scrutiny. A lot of what is said above applies in this case but there are clearly many more legal issues involved. The article linked also reports on legal issues with the poster campaign. "The EHRC, which is responsible for policing the Equalities Act, to which all public bodies are bound, is also investigating the controversial anti-immigration advertising campaign targeting racially mixed areas of London. 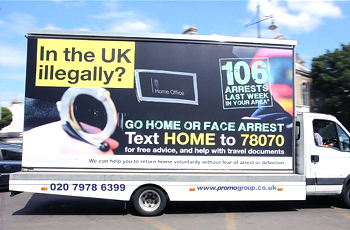 The government campaign has used mobile billboards warning illegal immigrants to "go home or face arrest". An EHRC spokesman said on Friday: "The commission is writing to the Home Office about these reported operations, confirming that it will be examining the powers used and the justification for them, in order to assess whether unlawful discrimination took place. "The state has a choice; at all times and in all policy areas. It has a choice of positivity versus negativity. This choice certainly extends to an official departmental account. Instead of advertising hapless nail technicians being led away in handcuffs, you can tell us what action you are taking to reduce the backlog of immigration and asylum applications. Instead of broadcasting, you can engage. Instead of encouraging at best distrust and at worst xenophobia, at a time when soldiers are decapitated in the street and mosques are being blown up, you can encourage understanding and community. You have a choice. To foster the best in people or fuel the worst in them. So far, you have chosen the latter." Any piece on UK migration should link to this excellent piece by the Center for Economic Performance outlining the facts on migrations.